I found these in a folder labeled “Sammy’s.” They aren’t dated but just eyeballing them I’d say circa 1980. This is another one of those times when I’m not absolutely confident about what I’m looking at—these scenes bear little, if any, relation to what I’ve known as Sammy’s since I came in 1991. It doesn’t even seem to be the same space, although I suppose it might have been heavily renovated at some point. And this mural! I’m not sure what word properly describes it. I also note that the tables in this photo have linens on them while those in the first picture don’t. Is that Ron Sass on the left? Maybe he can explain some of this to me. 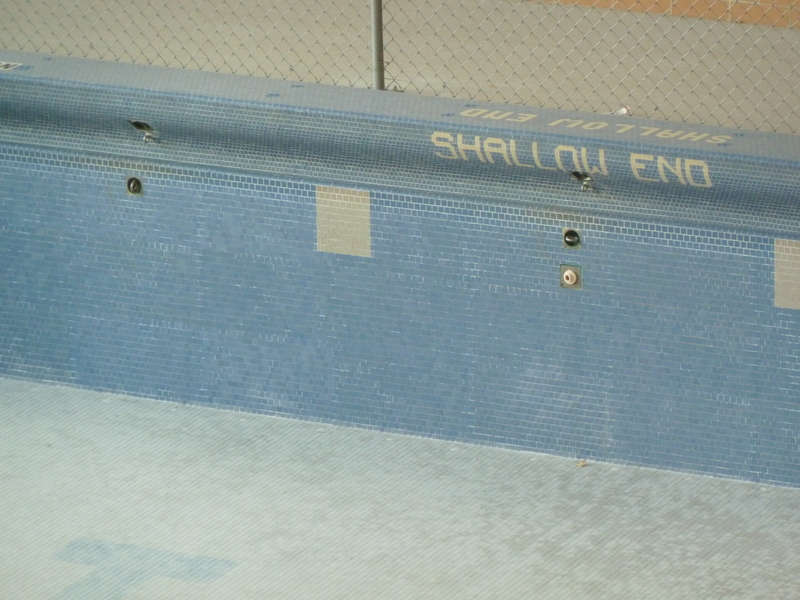 Bonus: Not just shallow, but extremely shallow. That is also Ron Sass in the center of the first photo obviously at a much later date. Note the same watch on his left hand. at its end, such as is picture, only on the side next to, well, Sammys. Looks like it’s open into the Grand Hall, which I don’t remember happening for dining very often. I started in 1980 and my gut is telling me this is earlier. I don’t remember that mural at all; also by 1980 short sleeves and black skinny ties were somewhat uncommon. I don’t recognize any of the people, either. I agree with Marty, I think this is from much earlier than 1980. I ate lunch at Sammy’s occasionally from 1980-82, after I moved off campus. The photos just don’t look very familiar to me. I was also a member of Hanszen; I matriculated the first year the new commons was opened. I don’t recognize anyone in either of the pictures. Based on the fashions, I think this must be from the early to mid 70’s. My theory is that the view in the first photo is from Sammie’s looking east into the Grand Hall. The large sliding wall panels separating the spaces are closed except for one–on which is a large mural (which I vaguely remember). First photo shows the terrazzo floor of Sammie’s. The second photo is just inside Grand Hall–hard wood floor under the serving tables. The third photo is from almost the same perspective as the first but this time with all of the sliding–mural covered–wall panels closed. You can see the panel breaks in the mural. My best guess. Ask Ron Sass. Oops! I meant to say that in the first photo the large sliding wall panels are OPEN except for one. 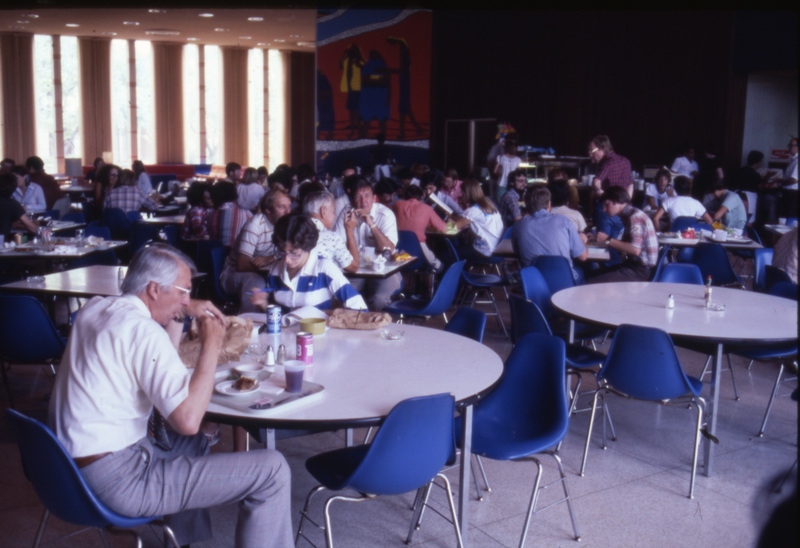 Here’s an alternate theory: The Hanszen commons burned down in the summer of 1975 and we spent most of the 1975-1976 year using the grand hall of the RMC as our temporary commons. I tried expanding the pictures to see if there was anybody I recognized, but no luck. Anybody else from that timeframe recognize anything? 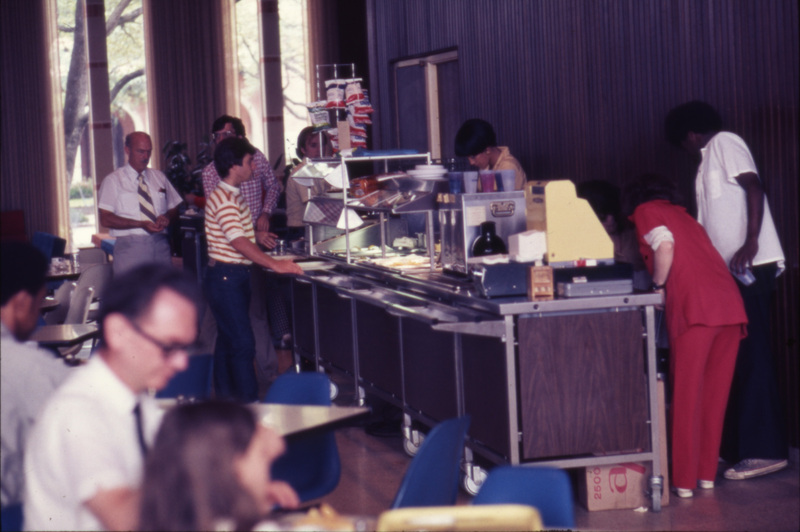 I don’t think this is during the Hanszen occupation’ since all of the pictures show a serving line with a cash register. This would imply that this is Sammys. The configuration was also used during at least one of the times that Cohen House was closed for renovations and expansion. The view is definitely from Sammy’s into the Grand Hall in the direction of the Chapel. The floor to ceiling draperies of the Grand Hall are visible in pictures 1 and 2. 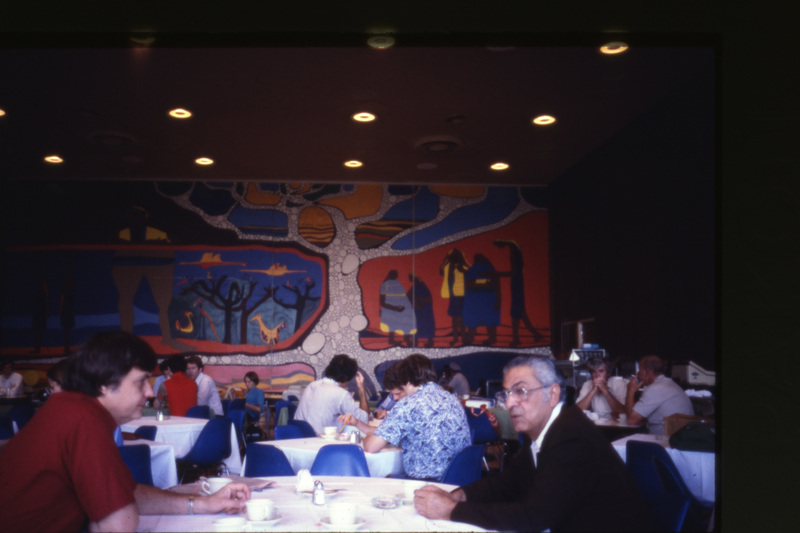 The mural was painted on the large folding doors that separated the Grand Hall from the adjacent Sammy’s dining area. I haven’t seen the mural since I was a student in the early 1970’s! I don’t know who painted it or what happened to it but it was there when I was a student. It was probalbly painted during the period 1971-73. Surely there’s a record of this somewhere in the University files. Yes, Melissa, that is me talking to Jorge Awapara. I can’t remember the year, but I look rather young to say the least. The mural was a student project and was on the wall between Sammy’s and the Grand Hall for sometime. Brad Bucher claims that I am in the first photo, I don’t think so. The guy in the center is Wayne Campbell of the Biology Department. I don’t see me anywhere though. Also in the first photo foreground is Bill Ackers. Don’t know who the female is at his table. Looks like Bill Philpott, also of BIology, two to our left of Campbell — white shirt with narrow horizontal stripes. He was College Master of Baker during my time there. I remember that mural with some fondness. As Leoguy says I’m pretty sure it was put up before 73, since I remember eating lunch in Sammy’s while I was a student with that mural in place. Awww… I miss that mural. Don’t miss the ashtrays, though.